Welcome to a place of enchantment. This unique cottage, a blend of the Old and the New offers the bliss of the mountains yet all the modern day essentials. Nestled on a ridge in the in-town Mirror Lake Neighborhood, it overlooks 6.5 Acres of wooded privacy from a wonderful 32 foot Living Porch (2/3 covered) with the enjoyment of Humming Birds, Owls, Stary Nights, and Total Peace. A fenced rear yard opens off the porch. It is an easy walk to Mirror Lake and just minutes away from downtown Main Street and all Highlands has to offer. The Absolutely Fabulous Master Bedroom with Cathedral Ceilings is separately located upstairs encompassing an incredible vista and wintertime mountain view. The Master Bath with jetted tub is like being in the woods. The Guest Bedroom with Extra Length Twin Beds (which may be joined to make a King) and second Bath, are privately located on the Main Floor. A Charming Music Room, for those who love Piano, is a wonderful retreat also allowing space for additional sleeping (Coleman Mattress) and offers an adjacent Half Bath. On those chilly evenings the wood burning stone fireplace adds the final touch of what we most seem to enjoy in our mountains. Welcome home !! **House will be Closed and Winterized for December through February. Disclosure: Owner is a licensed Real Estate Broker in North Carolina and Georgia acting as Principal. It's next door to Paradise. Quiet, Peaceful, Charming, & Cozy...Just like coming home. Exquisite !! Ridge View in the Winter - Tree Tops in the Summer & Always a Sunset - WOW !! Fenced Rear Yard off Porch is great for our four legged friends. The 5 Kelly sisters could not have been happier in our enchanted cottage. Beautiful, cozy cottage with tons of huge windows! Eclectic furnishings with all amenities. Owner is so gracious and accommodating! Easy to contact and super responsive to questions. The property is gorgeous and exactly what we wanted for our mountain getaway. Highlands is a perfect small town loaded with shopping and activities. Friendly people, great food and gorgeous views. 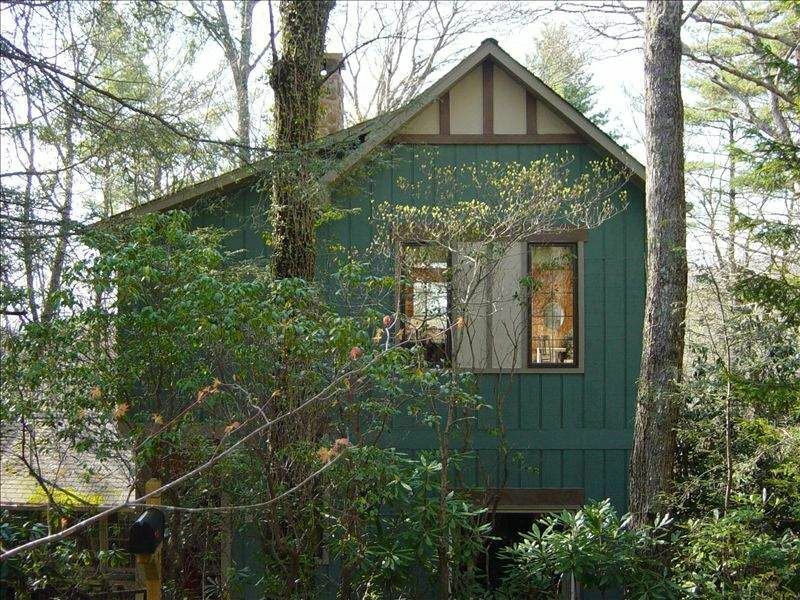 Enchanted cottage has everything you would want for a peaceful vacation. We can't wait to return during the summer to enjoy the huge back porch! Highly recommend! Super master suite upstairs with windows galore and mountain views on clear days. Wow ... the Perfect Guest !! Thank you for your most kind words and for sharing in our joy. It is such a pleasure to have guests who love and appreciate our special slice of Paradise. We look forward to having you visit again. Wishing You a Happy Happy Thanksgiving ! We were looking for something somewhat secluded and in the mountains but also close to town and this property met our needs. The owner was also attentive and made it clear that she was available if needed. Unfortunately we were disappointed with our stay. The cottage is dark, worn and has a very musty smell. Did not use the porch as the cushions looked dirty and moldy. I am disappointed you were disappointed. Of the many rave reviews in 15 years, this is my 1st unfavorable one. Still I appreciate your comments. That's what makes a market. Highlands is a Rainforest and heavily wooded, as is this property … not the beach for sure. There is Central Heat and Air plus a freestanding Dehumidifier in the Music Room which work beautifully to deal with the elements if engaged. As for not using the porch … that's unfortunate. The fabrics are water repellant and neither dirty and certainly not moldy. The double chaise cushion is new. Dark colored fabrics were chosen in keeping with a rustic décor. Sleeping in the tree tops! Lovely well appointed charming cottage near downtown Highlands. Enjoyed our porch sitting time and walks through the neighborhood. Recommend On the Veranda for dinner one night delicious. June was helpful and easy to contact. Older cottage with nice additions. Nice fenced area for dogs not commonly found in other rental cabins. Location close to Highlands. Black bear visited us during our stay. Highlands has something for everyone. It is a 'real' town as well as a destination for weddings and other special occasions. Most often it is 10 degrees cooler than Atlanta, for example. One can enjoy fabulous boutique shopping, fine restaurants, outstanding 'arts', as well as the 'run of the mill', plus exquisite scenery, cool summer temperatures, hikings, waterfalls, peace and quiet. New Zip Line is only minutes away! Is there something more?? **Wood is not supplied. If you would like a load of wood delivered, the cost is $60.00. I prefer e-checks. Please, "NO American Express" but I do accept Other Credit Cards.